When you’re effective as an executive leader, you get results through influence and inspiration, not command or coercion. By engaging others, you stimulate creative thought and build buy-in which leads to well-informed decisions and successfully executed plans. People enjoy collaborating with you and they’re eager to follow you because you earned their trust. You show up, day in and day out, as an authentic leader – self-aware, true to your values, open about who you are, unassuming and working for the common good. Your authenticity helps to shift the culture to one of teamwork, innovation, and commitment to excellence. Leaders get to the executive level because of their track record. But success can seduce them into believing that they have all the answers. When they don’t listen to others and truly value what others bring to the table, leaders lose out on the breakthroughs that can happen when a variety of perspectives and ideas are considered. They’re seen as arrogant and disrespectful. Eventually, they find themselves out in front with no one behind them. Their people aren’t working together; things aren’t getting done. Feeling under-valued and part of a losing team, their best talent starts to jump ship. And things go downhill from there. The higher you go in an organization, the more your success depends on your ability to get things done through others and that requires trust. Even in the healthiest of environments, it takes time to earn trust, and you’ll never get there without authenticity. 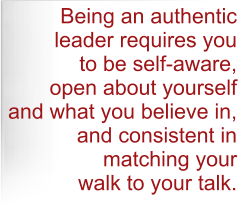 Being an authentic leader requires you to be self-aware, open about yourself and what you believe in, and consistent in matching your walk to your talk. Even if all these skills come naturally to you, it can be a real challenge when you’re under pressure. We begin coaching with getting clear on who you are, what’s important to you and where you want to go. This helps you keep your head on straight as challenges come your way. Next, through a 360-degree assessment survey and/or interviews, you’ll learn how others see you. Occasionally I’ll watch you in action and give you feedback. Some of what you hear will likely confirm your self-perceptions, and some might be new information for you. We will probably unearth a hidden strength or two – capabilities or traits second nature to you that others see as particularly valuable to the organization. You’ll likely find that you need to refine a couple of leadership skills, like identifying and developing key talent, or communicating a vision that inspires and motivates. You’re being counted on to make sound decisions and implement them. As your coach, I’ll encourage you to see things from other perspectives and to be deliberate and disciplined in your decision-making. We might also work on keys to execution, like tactical planning, setting expectations, holding people accountable, and building a high-functioning team. There will be times when I make observations, ask questions, and challenge you in ways that few others will (except maybe your family). You might feel a tad uncomfortable, but the rewards will be insights and breakthroughs you need to be even more effective. 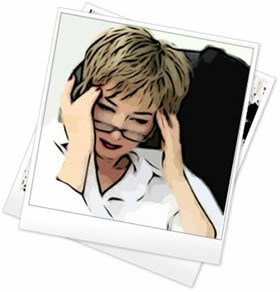 Of course, there will be times when frustration, self-doubt, or other troublesome feelings threaten to hijack you. Coaching helps you recognize those forces and manage your thoughts, emotions, and impulses rather than letting them manage you. It’s true that it can be lonely at the top, and sometimes you just need someone to listen. Whatever problems you’re grappling with or feelings you’re having, no matter the source, you deserve to be heard and supported. As your coach, my top priority is your well-being and my job is to be in your corner. a better leader and turn his business around.